We believe in the power of discovery to change our environment and our way of life. Turning breakthroughs into cures, new technologies into businesses, and research results into community action is at the core of IUPUI research culture. IUPUI collaborates with nearly 200 companies and organizations to develop hundreds of student internships and research projects that serve our community. Helping our communities through research is one way IUPUI grows student leaders and socially conscious citizens. We learn how to bring our discoveries and cures to the market—and to form business ventures that improve our quality of life. Chris speaks: I was going to the University of Florida at the time, in the late ’90s, early 2000s. The Internet boom was happening, and computers were a big deal, and the advent of all of that. I also wanted to apply what I did to what I felt like was an industry that mattered, that had a real impact. And so that wasn’t, for me, finance, or that wasn’t other businesses, right? Chris speaks: So that’s what got me interested in health care. So I’m working on chronic pain and how primary care doctors and patients interact and how doctors get the information they need to best treat chronic pain. This is critically important because chronic pain is complex. Chris speaks: It has physical components, it has mental components, it has social components. And the main medicine that we’ve been using for the past 20-plus years to take care of chronic pain, namely opioids, prescription opioids, have all kinds of risks associated with them. Chris speaks: And so now doctors are increasingly faced with trying to best weigh the risks and the benefits of opioids versus other medications for chronic pain, all in really short visits, typically. You go to a primary care doctor you get eight, 10 minutes with your doctor. Not a lot of time to parse through all the complexities of chronic pain, all the complexities of potential risks of prescription opioids and the potential abuse of these. And so this makes doctors’ jobs really hard. Chris speaks: So what we’re trying to do is we’re trying to help doctors sift through all of the information. Information about patients’ symptoms, information about patients’ history, about the other doctors they’ve seen, about their potential risks of misuse or abuse of opioids. We’re trying to help them sift through that by redesigning their computer systems. By setting up their computer systems so they get the right information, the information they need, when they need it. Chris speaks: What excites me about my field is the great potential of computers, of electronic health records, to improve health and health care. We live in a world with massive amounts of information, medical information, health information. Chris speaks: And computers have the potential to help parse that down to deliver it to the right person at the right point in time to ultimately help us make better treatment decisions and to give patients better outcomes. Receiving the Trailblazer Award is really a great honor for me. I think it’s validation. I think it’s validation on multiple levels. It’s validation of all of the work that I’ve done, all of the work that my team has done. Everything I do is team-based. Chris speaks: I work with students, I work with faculty collaborators, I work with postdocs, so it’s validation for all of us as a team. And I think most of all it’s validation that the work we’re doing matters and it matters beyond an academic journal. It matters to everyday people, doctors, and most importantly patients. 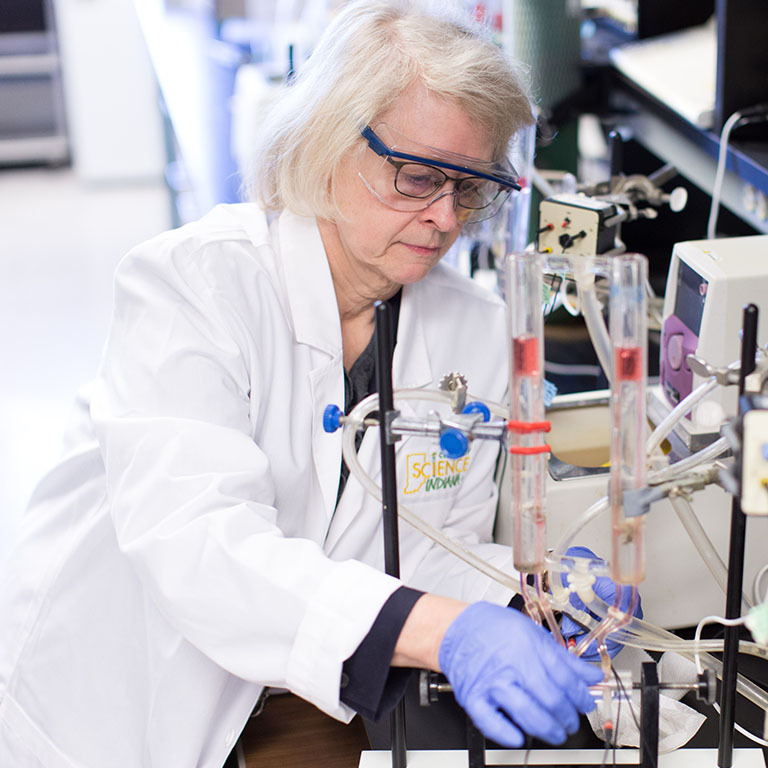 The IU Innovation Center Indianapolis—located near the renowned IU School of Medicine—builds startup companies through collaborations with the IU Research and Technology Corporation (IURTC) and the IUPUI community. Through research, IUPUI is improving health care, creating new companies and jobs, and providing valuable community resources. 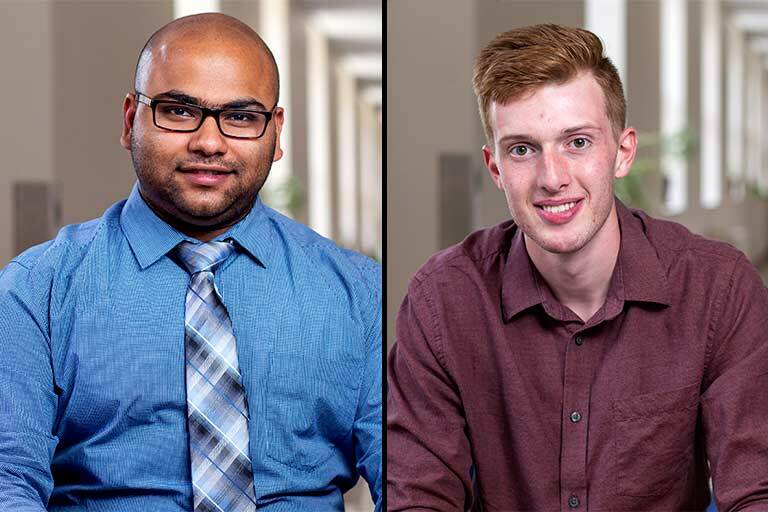 IUPUI students Josh Roy and Abhinaba Bhattacharjee are changing the future of physical therapy. They are part of the research team at faculty-led startup Health Smart Technologies that’s designing a medical device that can quantify the forces applied during manual therapy. 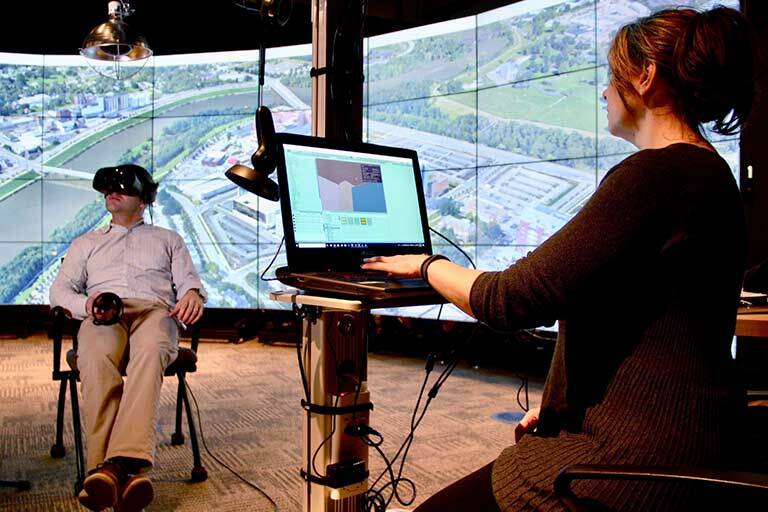 Dr. Dmitriy Golovyan, an IU School of Medicine Pulmonary and Critical Care fellow, and Wen Krogg, a School of Informatics and Computing graduate student, teamed up to create a virtual reality brain care therapy to speed mental recovery in critically ill patients. Through programs like the Enhanced Mentoring Program with Opportunities for Ways to Excel in Research (EMPOWER), IUPUI is helping faculty members who are part of historically underrepresented or excluded populations succeed in their scholarsip efforts. It pairs established faculty mentors with newer faculty mentees to help them become more productive researchers and achieve a high level of excellence in their academic pursuits. Josette speaks: I know how difficult it was for me when I came to campus to establish networking, and so I wanted to help other people to get acquainted with the environment and get started as soon as possible. Meganne speaks: There are different kinds of challenges when you arrive on a new campus, the first of which Josette touched on a little bit—which is being a female in STEM. So it’s nice on the one hand to have an established researcher who’s in the STEM field who’s female that you can look at and you can ask, “How did you get to the point where you are?” There are so many ways that the university supports research here at IUPUI that when you’re a new faculty member it can be a little daunting trying to figure out what the right path is. Having Josette as a mentor has been unbelievably helpful because she’s been able to help steer me towards those collaborations and research relationships that are setting me up to be successful at IUPUI. Josette speaks: When you mentor women you get more connection because you understand, you have the same kind of disposition and having another woman to talk to helps especially in higher education. And I have to tell, I learned from the questions and your research to modify my own research, to add something that may get it approved now. Meganne speaks: And I actually borrowed one of her research questions and added it into my research because there was a piece of the patient experience that, once I read her research, I was clearly missing. Josette speaks: So we both benefited from it. Whether the topic is community health, women’s rights, or racial injustice, IUPUI researchers are working hard to dispel myths and bring clarity to issues that effect us all. Janet speaks: “Hot Flashes? Cool!” is an art exhibit that’s designed to educate the public about menopausal hot flashes. Janet speaks: We’re using the creative arts to display scientific information from about 500 research studies that have been published. We know that women’s experiences at menopause are very individualized, very different from one another and there’s been some research done that shows that women in different cultures actually feel hot flashes differently. hidden within the sculptural pieces, and so we’re really trying to create a new collective image of menopausal hot flashes and provide information to the public in a creative and engaging way.